What kind of creek am I looking for? Interests:...change based on wind and moon phase. My friend and I have decided to try panning gold. We live in Huntersville NC in Mecklenburg county. From my research, we are surrounded by old gold mines and gold belts. So today we jumped in the car and went out to find a creek to pan gold. We found lots of creeks - plenty of privacy. Easy parking. 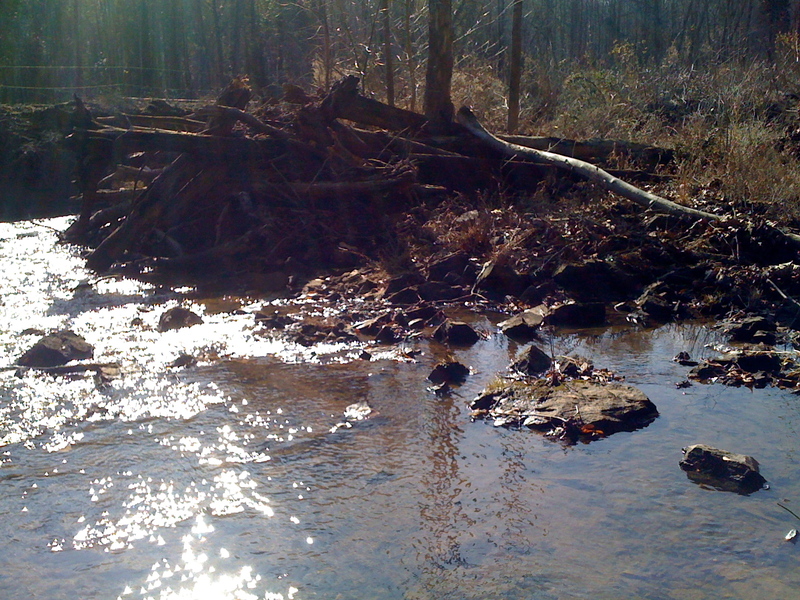 But the creeks we found were slow moving, with lots of silt. We "panned" and found plenty of quartz and black sand but no hint of gold. My question is ... Is a muddy slow creek just as good as a fast, rocky one? Is a fast stream better? Any hints are appreciated. We were out in the Lincoln county area if anyone knows where that is. No metal detector. I haven't heard or seen any reports of gold from Lincoln county, you would do better at finding gold in Mecklenburg county. Here is a list of N.C. counties that I have heard or seen reports of gold being found. Burke, Cabarrus, Catwaba, Cherokee, Granville, Davidson, Franklin, Guilford, McDowell, Mecklenburg, Moore, Montgomery, Randolph, Rowan, Rutherford, Stanly, Transylvania and Union. As far where in a stream, any stream large or small in a gold bearing area could have gold, you will have to look in anyplace that the water slows down, if you have a narrow portion of a stream that eventually widens, gold will drop out as the water flow slows in the wider portions, and inside bends of a stream or river the water flows slower that the outside bends, or areas that has obstacles that will slow the flow, large rocks/boulders, bedrock "riffles", logs, etc., check the downstream side of the obstacles, you most likely will find the gold down on top of clay, bedrock, or any surface that is not churned up by moving water that will stop the heavy gold from sinking downward further, how far dwon you have to dig depend on how deep the impenetrable material is, you can sometimes find fine "flood gold" in inside gravel bars where the fine gold hasn't sunk to deep because of the material not getting churned up that often, you can also check any moss on rocks for fine gold as moss will act like miner moss or carpet in a sluice and trap fine gold. Good luck and let us know how you do in your new adventure! Interests:Anything that will get me out of the house. At the base of any little waterfall, or where the water eddies. Right below where the waterfall hits the pool. Work your way outward and you can still find fines. As mentioned above, anywhere the water slows down. Look right where fast water enters a pool, not where it flows out. Always work upstream, that way you don't run the same material over and over. Thank you Skip and Steel Pan. I read more forums last night and seems we missed an essential part of the process. We didn't dig down to the bedrock. Looking forward to giving it a try. I'll let you know! There's definitely gold in Lincoln county for sure...but a common problem is the one you ran into. Alot of development in the area combined with relatively slow stream gradients causes many streams to be silted up in and around Charlotte. There's gold all around in every direction from Huntersville, just keep checking, the key is to get to bedrock. Now there are times where smaller flood gold deposits in flow sand, but usually the deeper the better, exposed bedrock = easier digging. Just keep tabs on property access and abide by the rules and enjoy! Thanks so much! That's so encouraging! I thought there was gold in Lincoln - I've seen gold panning trips advertised. Since reading responses I've spent wayyyy too much time staring at google satellite! Thanks for the tips and encouragement. You're not always going to be able to reach bedrock, but yes, that's the goal. That's where the "Old Gold" will be hidin'. When ya do find bedrock, start on the down stream end and work your way up stream, cleaning out every nook, cranny, hole, crack, and ledge. There's a lot of "New Gold" in the overburden on the bedrock, so don't be slack there. I went down to that creek at my office today. MUCH further back on our business property than I thought! But the creek is GREAT. I'll post pics tomorrow. 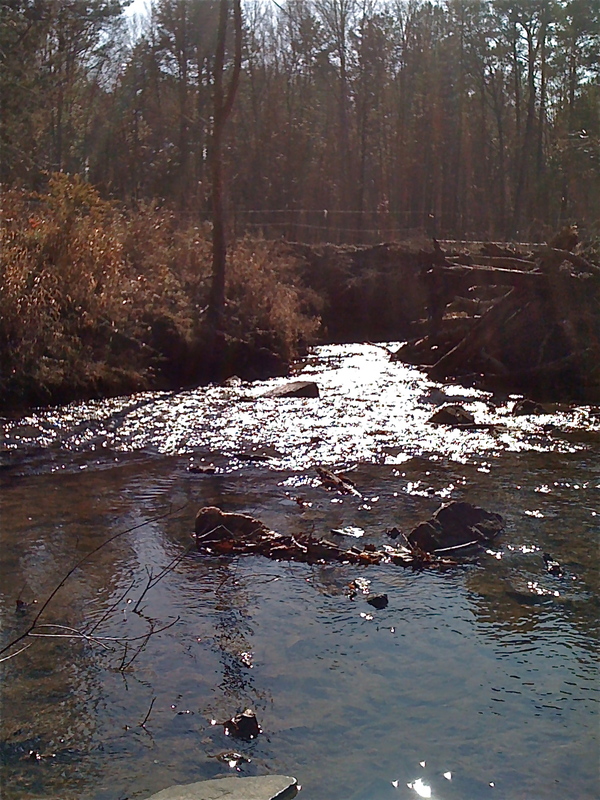 Here are some pics of the creek behind the campus where I work. It's about 20 feet wide I guess. And as you can see it's divided here by a pile of debris about the length of a school bus. The left is fast moving and babbling - the right is slower an mucky. I'm thinking... snakes. Is this a spot you'd play in? Thanks for all the tips! What's a bench? What's overburden? What's the difference between old gold and new gold? My gold pans arrived in the mail today! OK - trying the photo upload again. Photos taken from my iphone. 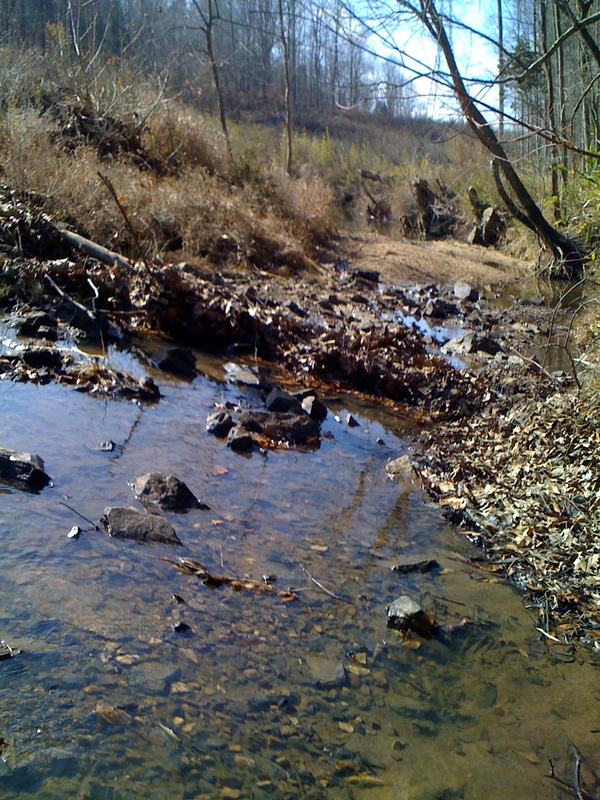 A bench is where the bedrock has been eroded and left a "Shelf" or "Bench" on the banks of the stream. It could be from a few inchs to several feet high. Overburden is the material that you have to dig through to get to the bedrock. Also the material lying on a "Bench". When you have gravels, rocks and sands lying on a bench, that is evidence of where the stream once flowed, prior to the erosion that produced the bench. Now, "Old Gold" vs. "New Gold". this is what I call "New Gold". When you get to the bedrock, and hopefully finding nuggets now, you are finding the "Old Gold", as I call it. Ya see, the Gold deposited on the bedrock was there first, the Gold in the overburden came later. So, Gold on a bench is "Old", Gold in the stream is "New". go to the down stream end of the babbles and start there. Work your way up the stream, digging behind (down stream side) and under rocks in the stream. You most likely will not have to worry about snakes this time of year being that it is too cold for them to be active, if you do happen upon a snake this time of year they will be rather sluggish and slow moving. Now that you have a new hobby or addiction (this will happen when you find the first gold in your pan :whaaaa: ) of gold prospecting and will be working streams and rivers after you come down with the infection of GOLD FEVER, you should start now in learning what the different kind of snakes look like in your area as you will most likely run into a few in the warmer months, the poisonous snakes in your area would be Copperheads, Water Moccasin/Cottonmouth(not to be confused with the Brown Watersnake) and possibly a Timber Rattlesnake to be able to readily ID the ones you want to steer clear of, all of the other snakes you shouldn't worry about even though they can still bite you if you mess with them, but a bite from all the others will not require you to seek medical attention. You can find many online pictures of the snakes in your area, poisonous and non-poisonous to help you get familiar with what they look like. I don't kill any snakes as they control rodents and other vermin populations, but will relocate them several miles away if necessary, just be careful and watch where you put your hands and feet and you shouldn't have much problems with snakes as long as you're aware of your surroundings when out in their domain. Always use your shovel handle or long stick to check out any possible hiding places of snakes before you stick your hands or foot there, also snakes can blend into their surroundings very well when out and just laying in the sun so check out the area carefully and often. A beach is also where the river flowed 100s and 1000s of years ago before the actions of nature changed the course of the river, a beach can be a few feet and up to thousands of feet away from the present course of the river, there can also be benches of ancient rivers that don't exist anymore that can be crossing the present day rivers and can be the source of the gold being found in the present river, you will be able to recognize a bench by the rounded rocks worn down by water action that is contained within the bench deposit, a bench deposit will also be very compacted in some cases as hard as concrete and most likely require some work to break apart, such hammer and chisel, pry bars etc. One thing I might suggest is that you either find someone that has some raw gold that will let you see how it acts in your pan and to see how small some gold can be so you will be able to know when you really have some gold in your pan, or buy yourself a small bag of gold cons to practice panning at your leisure in your back yard with a catch tub so you can pan the material over and over, it does take a little practice developing your panning technique at the beginning and to be able to know what real raw gold looks like and how it will act in your pan. If you decide to buy some cons I can recommend a supplier to buy from without you risking being ripped off.